Author Jennifer 8. Lee holds an image of a dumpling emoji before eating lunch at the Dumpling Time restaurant in San Francisco. 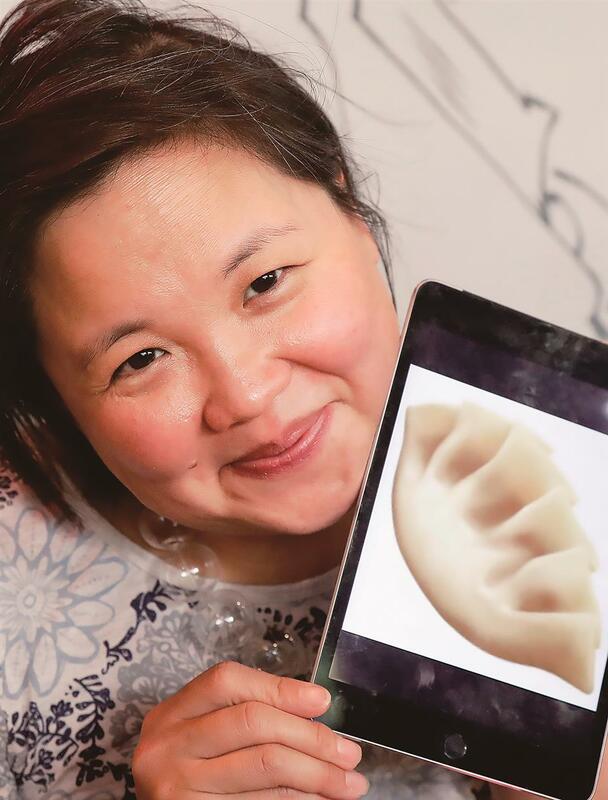 Thanks largely to Lee’s efforts, the dumpling emoji was added to the Unicode Standard this year after almost two years of research, meetings and a written, illustrated proposal. We have a smiling pile of poop. What about one that’s sad? There’s loaf of bread and a croissant. But where’s the sliced bagel? The Unicode Consortium is tasked with setting the global standard for the icons. It’s a heady responsibility and it can take years from inspiration to a new symbol being added to our phones. That’s because deciding whether a googly-eyed turd should express a wider range of emotions is not the frivolous undertaking it might appear. Picking the newest additions to our roster of cartoonish glyphs, from deciding on their appearance to negotiating rules that allow vampires but bar Robert Pattinson’s or Dracula’s likeness, actually has consequences for modern communication. Not since the printing press has something changed written language as much as emojis have, said Lauren Collister, a scholarly communications librarian at the University of Pittsburgh. Growing and adapting doesn’t seem like an issue for emojis. The additions for 2017 included gender-neutral characters, a breastfeeding woman and a woman in a hijab. These tiny pictographs became a part of our online language with the ascent of cellphones, getting their start in Japan in 1999 — “emoji” combines the Japanese words for “picture,” or “e’’ (pronounced “eh”), and “letters,” or “moji” (moh-jee). At first, there were just 176: simplistic, highly pixelated icons. Today there are more than a thousand. Because none are taken away, their number only keeps growing. “Long after you and I are dust in the wind there will be a red wine emoji,” said Mark Davis, the co-founder and president of Unicode Consortium who also works at Google. Anyone can propose an emoji. But for it to make it to phones and computers, it has to be approved by Unicode. The nonprofit group, mostly made up of people from large tech companies like Apple, Google and Facebook, translates emoji into one standard, so that a person in France, for example, can send an emoji or a text message to a person in the US and it will look the same, no matter what brand of phone or operating system they use. From the proposals to the design, a bevy of rules govern emojis. To submit a proposal to Unicode, you must follow a strict format, in writing, that includes your emoji’s expected usage level, whether it can be used as an archetype, a metaphor for a symbol (a pig face, for example, can mean more than the face of a pig and represent gluttony). Each year, a new version of the Unicode Standard is released. This year we got Unicode 10.0, which adds 8,518 characters, for a total of 136,690. 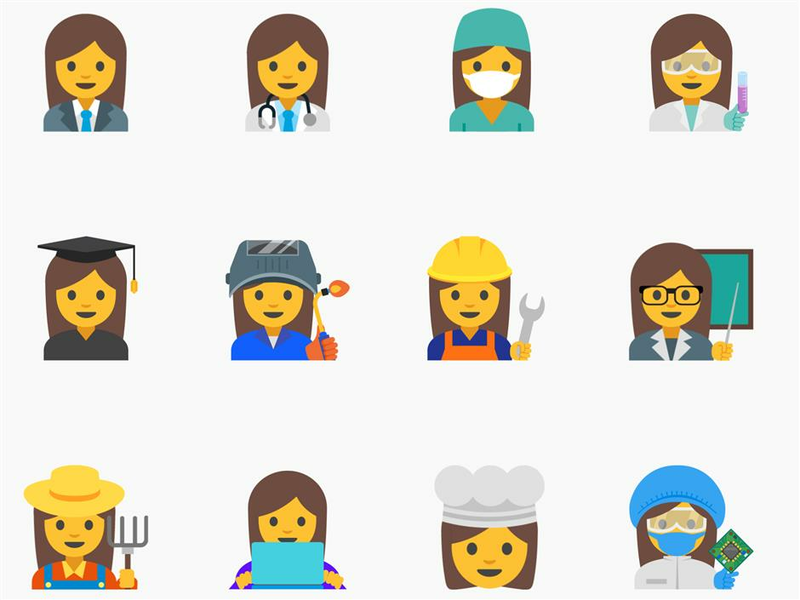 Emojis proposed by Google highlight the diversity of women’s careers. And then there’s the dumpling. Back in August 2015, journalist and author Jennifer 8. Lee was texting with her friend Yiying Lu, the graphic designer behind the iconic “fail whale” illustration that used to pop up when Twitter’s network was down. 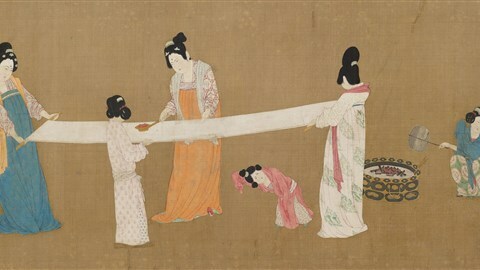 It dawned on Lee that there was no dumpling emoji. “There are so many weird Japanese food emoji,” she said, but she didn’t understand how there could be no dumpling. After all, dumplings are almost universal. When she showed up at her first quarterly meeting of the Unicode Emoji Subcommittee, most people there were “older, white male engineers,” from the big tech companies. The debates are as esoteric as they are quirky. Should “milk” be in a glass or a carton or a bottle? Pancake or pancakes? Many of the emoji decision-makers are engineers or have linguistic backgrounds, she said, but very few are designers. As part of their efforts to diversify emojis, Lee and Lu founded Emojination, a group promoting “emoji by the people, for the people”. But when they proposed the frowning poop, they met with some resistance. “Will we have a CRYING PILE OF POO next? PILE OF POO WITH TONGUE STICKING OUT? PILE OF POO WITH QUESTION MARKS FOR EYES? PILE OF POO WITH KARAOKE MIC? Will we have to encode a neutral FACELESS PILE OF POO? As an ordinary user, I don’t want this kind of crap on my phone,” wrote Michael Everson, a linguist and typographer, in a memo to the Unicode Technical Committee.